Hard work allows the talented to make it all look so easy but there was something otherworldly about Leona Maguire's seemingly effortless move into contention on her professional debut in the ShopRite LPGA Classic. Perhaps we shouldn't be surprised after watching Stephanie Meadow finished third on her professional debut in the US Women's Open at Pinehurst four years ago. College golfers are ready to hit the ground running these days, as we saw with Paul Dunne when he co-led the Open Championship after 54-holes at the Home of Golf in 2015. 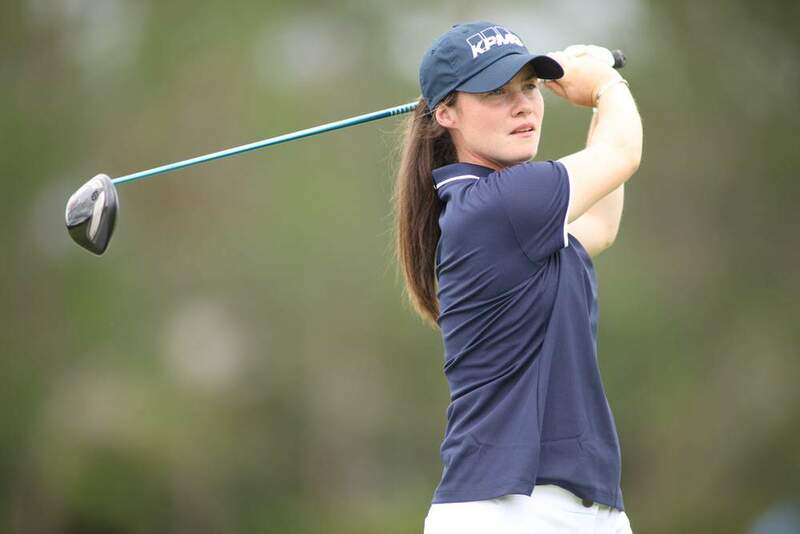 Given her talent and tenacity, it's not beyond the bounds of possibility that 23-year-old Maguire from Ballyconnell in Co Cavan can overcome a four-stroke deficit (at least) and win on her debut at the 6,217-yard Bay Course at Stockton Seaview Hotel & Golf Club near Atlantic City. After "leaving a few shots out there" in an opening, two-under 69, the former Duke University star took advantage of perfect scoring conditions early on Saturday, making an eagle, five birdies and three bogeys in a four-under 67 to finish the day tied for sixth, just four shots behind clubhouse leader Celine Herbin of France on six-under par. A three-hour weather delay meant that 36 holes had yet to complete their rounds when play was suspended at 8:14 pm local time, leaving Leona provisionally tied for 11th place on a packed leaderboard. "I wanted to give myself going into tomorrow, so more of the same," she said of her final round goal after closing her day with back-to-back birdies. "Hit a lot of fairways, hit a lot of greens. "I had quite a few chances on the front nine that I didn't hole so maybe hole a few more putts tomorrow, and we'll see where we end up. "You'd like to be as close the lead as possible, obviously but if you play well there are a lot of birdie chances out there. If I go on a run like I did today, you can move up pretty quickly." Feeling comfortable alongside former college rivals Maddy McCrary and Lauren Coughlin, both of whom will miss the halfway cut today, Leona dropped a shot at the tough par-four second but didn't panic. She had just 10 feet for eagle at the par-five third and two-putted for birdie, then bogeyed the 193-yard seventh when she pulled her tee shot into deep fescue long and left. A bogey four was a result there and she soon got motoring, converting from eight feet for a birdie at the eighth and from 10 feet for eagle at the par-five ninth where she hit a 238-yard five wood to the green. Now three-under, she fired a nine-iron to three feet at the 10th and holed the putt to go three under for the day and while she bogeyed the 12th after coming up a 12 feet short with her attempt to scuttle a fairway wood up the pin from the left rough, she never lost patience. She did well not to three-putt the 14th after racing her slick, long-range birdie putt 12 feet past the hole. There was a mini fist pump after that one fell for par and after a Harrington-esque pitch from the apron of the 15th yielded a tap-in par three, she chipped dead at the 16th to secure another par. Then came those closing birdies — a wedge to 30 inches at the 119-yard 17th and two-putts from 45 feet at the 507-yard, par-five 18th after an arrow-like seven-wood found the green. "It was always going to be tricky starting off on those first few holes," she said. "I hit a bad shot into two and made a good bogey there. Then I gave myself a good eagle chance on three, and that was a nice way to bounce back. "I really took advantage of the par-fives today [4 under compared to level on day one] which was something I wanted to do today that I didn't do yesterday. "That eagle on nine gave me a lot of momentum heading into the back nine, and that loop is always tricky around 11, 12, 13, 14 so I made some really good pars there and managed to get the two birdies at the end. "The run from eight to ten was nice. But I just had to stay patient. I knew there would be chances." Asked how her debut has felt so far, she smiled. "I felt pretty calm," she said. "I didn't feel all that different really. I am just playing my own game, and this course suits me pretty well, which is nice to start on. "I am just playing steady and solid, picking up birdies and not doing too much wrong." Ranked 269th in the world, Herbin (34), captured the Lacoste Ladies Open de France in 2015 but hasn't had a good season so far, missing six cuts from 11 starts with her best finish a share of 28th in the LPGA MEDIHEAL Championship in April. But her short game is working so far this week, and a pair of 66s gave her a two-stroke lead on 10-under par from Mariah Stackhouse (69-65) and South Africa's Ashleigh Buhai (68-66), Annie Park (69-65). South Korea's Sei Young Kim ended the day tied for the lead with Herbin on 10-under, eigjt under for the day, with three holes of her second round to complete when play resumes at 7:15 am on Sunday. Lisa Maguire followed her opening 84 with an 82, the highlight an eagle three at the third, as she gained more valuable experience before she tees it up with her sister in the Forsyth Classic on the Symetra Tour in Illinois next week.